Mass Save is currently offering homeowners a great way to update their outdated home heating system to a newer, energy efficient model. Homeowners with a boiler that is over 30 years old are eligible to receive up to $4,000. If you have a 12+ year old furnace heating your home you are eligible for up to $1,000. You need to schedule a home energy assessment before September 30, 2014 and have the equipment installed by October 31, 2014 to be eligible. Get your energy assessment out of the way before the fall rush and miss the deadlines because of a late start. 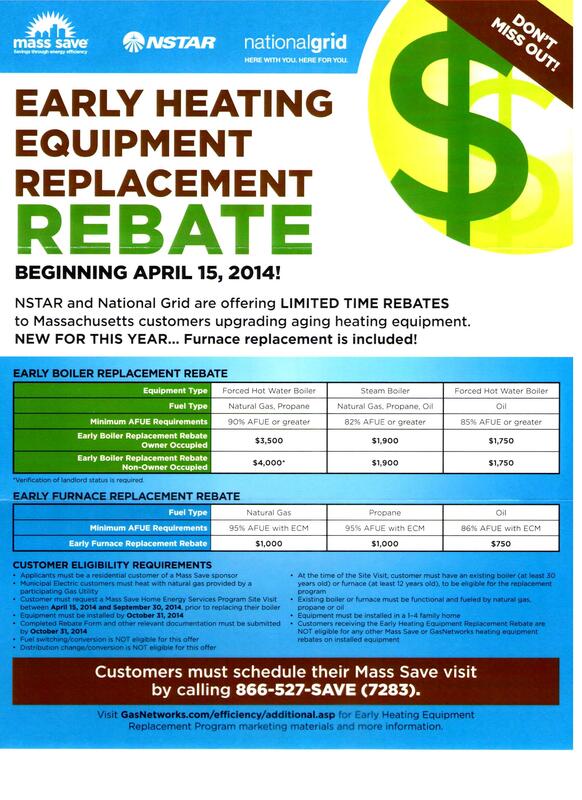 This rebate is good for any fuel source gas, propane, oil, but does not cover converting from one fuel to another. Remember to check the Mass Save website periodically, they give you great rebate options for a variety of energy efficient home improvements.